Nothing could be fairer in business than a User Pays Model. Now you can benefit from a cost effective solution for your bottom-line. The Nucleus Platform allows your business to utilise a USER PAYS MODEL which mean you only pay for what you use. 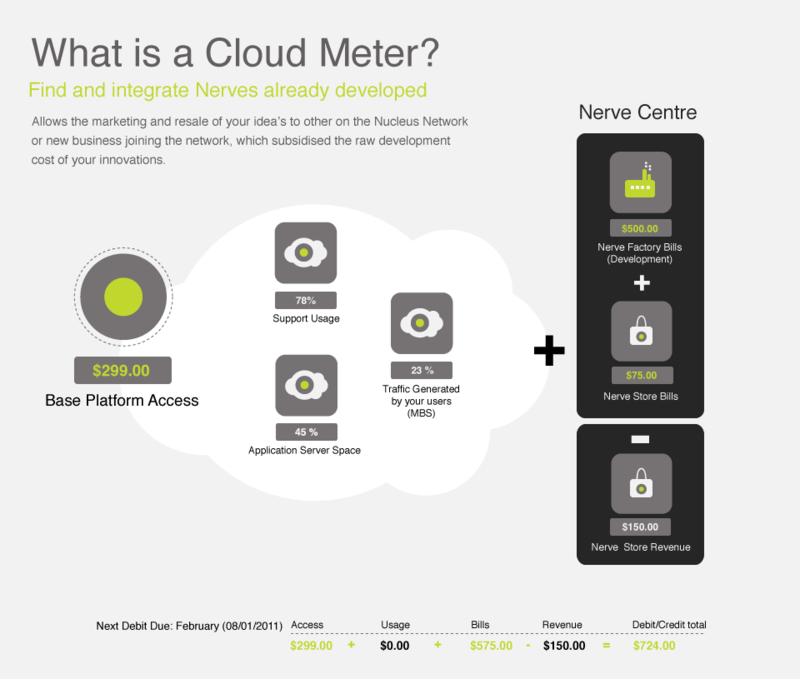 We call it Cloud Metering and it benefits your business bottom-line. See below how this can be cost effective and potentially cost neutral to your business. In fact, it could become a profit centre! We offer Cloud Billing Plans designed around the cloud space. Your monthly bill is based on the traffic your application receives, support hours you log and the cloud space your business application uses. We only charge you as your business grows and you have the flexibility in moving up and down on these plans similar, to your mobile phone plan. The part where we differ is we provide you opportunity to develop your own customised Nerves to suit your business and hopefully other businesses in the The Nerve Community. From there we can on-sell this Nerve in The Nerve Store to provide your additional revenue streams back to you to subsidize your innovative idea’s. In the example above you will see a cost for access to The Nucleus Platform with your business usage levels. We then have the ongoing bills you have chosen to incur through ongoing development of your system and inside the platform purchases of existing Nerves. You will also see that you have made $150 in revenue this month through other businesses on the system finding your Nerve applicable to there business and purchasing within their system. These purchase by other businesses reduces your monthly bill.